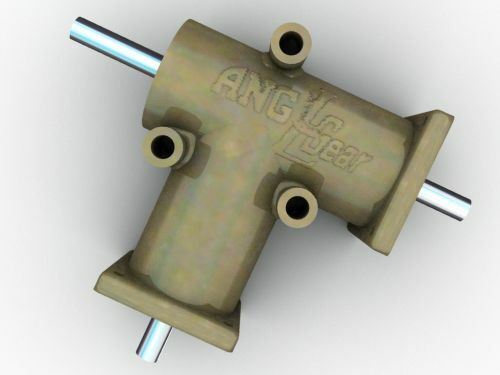 The AnglGear, the original right angle drive, is widely recognized and is in use worldwide. The AnglGear provides manual or power transmission of rotary motion in a compact, standardized right angle unit. Our standard line of bevel gearboxes are available from stock in both an Inch and Metric Series, single or dual output shafts, 1:1 or 2:1 ratios, and grease lubricated for life and have an operating temperature range of - 65 degrees F to + 200 degrees F ( - 54 degrees C to + 93 degrees C). Utilizing carburized case-hardened Coniflex* bevel gears, all AnglGear units employ completely enclosed & sealed ball bearings. The cast aluminum housings are precision machined, on our CNC machining center and then coated with a chemical film to protect the material, and use flanged ends and side bosses for compact installation in a wide range of applications. The shaft material used for sizes 1, 2 and 3 is #416 stainless steel. On the 2:1 models, the pinion shaft is carbon steel. For the sizes 4 & 5, the material is black oxide carbon steel. Shafts can be provided with special extensions (with flats, splines, holes, etc.) and /or specific lengths upon request. In addition to our standard models, we will modify our units to meet your design specifications! Our sales and engineering departments are ready to assist you with your specific application requirements. AnglGear Quality Specifications: Every AnglGear manufactured is tested to meet our quality specifications and are 100% inspected prior to packaging. This process ensures a consistent quality of our gearboxes. Backlash: Each unit is checked for its gear-mesh backlash to ensure it is within the prescribed backlash range. For Size 1, the backlash range is ¼ to ¾ degree. For Size 2 through 5, the backlash range is 1/8 to ½ degree. For special applications requiring reduced backlash, please consult the factory. Military Specifications: Andantex USA meets MIL-I-45208A for Inspection System Requirements. We can conform to military contracts specifying various MIL-SPEC requirements.